Wrangler, aka SP's Pep Boy, is a 7-year-old red fawn male, born January 16, 2000. His sire is Rapido Rambo and his dam is Bobby's Spymaster. Wrangler was a Texas racer, competing at Valley Greyhound Park and the Corpus Christi track before finishing his career with a total of 181 races under his belt. Wrangler was adopted a year ago, but unfortunately things did not work out and he now finds himself once again looking for his forever home. 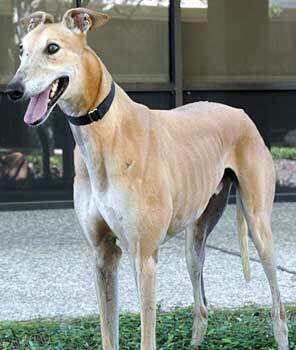 Wrangler has lived in a foster home with cats, Greyhounds, birds, and a Terrier mix. 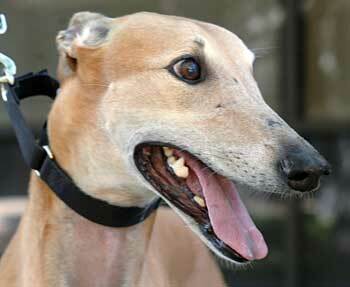 He currently lives with another Greyhound and cats. He prefers the company of other dogs to being a single pet. Both of Wrangler's eyes require drops put in them twice a day, and he will need this for the rest of his life. He has an immune-mediated superficial keratitis with some corneal degeneration, and sees an ophthalmologist annually for a check-up. Wrangler loves you, even though he hasn't yet met you. Never before have we met a foster who moved into a home so easily. Wrangler walked into our house, made himself comfortable, and "announced" with his happy, contented tail-wag that he already knew he loved it here and that he loved us. He is not only adaptable, but appears to be a very smart boy. He never had a problem with the laminate flooring. By his second meal, he figured out which side to line up on to get his meal. By the second night he remembered that right after the nighttime trip outside, one waits patiently to be brushed and then gets a nighttime chew treat. He sleeps quietly all night, waiting for us to get up. When we do, he is ready to roll. 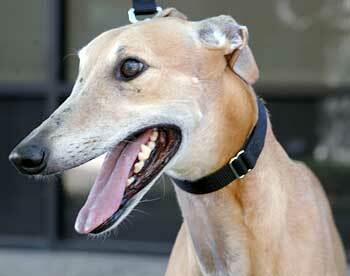 He loves walks and has proven himself to be a good long-distance walker. He jumps for joy when anticipating a walk. He loves his meals and treats too. Wrangler is completely cooperative about his eye drops. It takes less than 10 seconds twice a day to medicate him. He is cat tolerant, a very important consideration in our household. He also did not pay much attention to the puppies across the street. Wrangler loves to be near you and adored by you, but mostly he wants to adore you. He just appreciates being able to lean his head against you or in your lap, cherishing head massages. He will devotedly follow my husband around for the opportunity to lean against him and show his appreciation for sharing his home. Wrangler makes it clear that he truly appreciates being "home" with you.